Objective: Join Mr Jumpz on his quest to see all of Adventureland. Tons of wonderous perils await, and you will need to help him past many wacky obstacles with perfectly timed jumps! 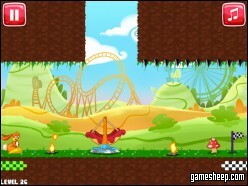 We are glad that you have chosen to play Mr. Jumpz Adventureland on GameSheep.com, the most dynamic website available. If you like this game Mr. Jumpz Adventureland don't forget to rate it and this way you will help with selecting only the best games for the home page.